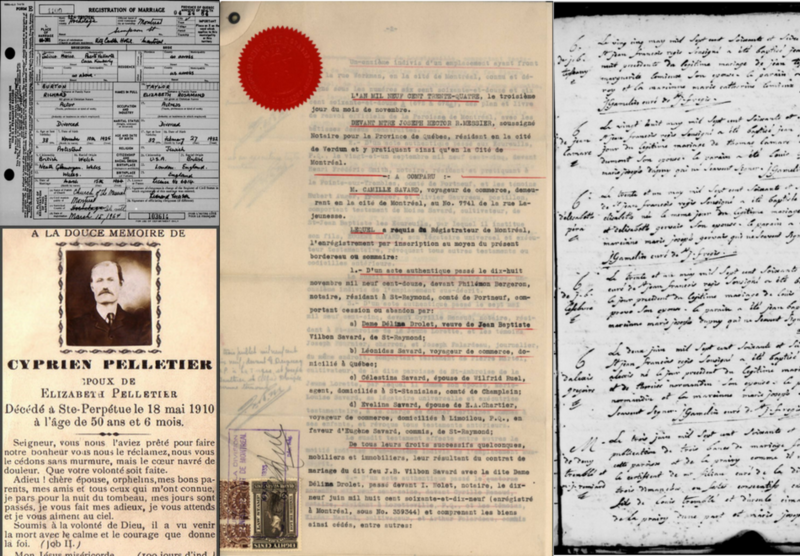 Genealogy Quebec is a subscription based research website regrouping all of the collections and tools developed by the Drouin Institute over the course of its existence. The website’s 16 tools and collections total for over 45 million images and files covering all of Quebec as well as part of the United States, Ontario and Acadia from 1621 to this day. Genealogy Quebec is by far the largest collection of Quebec genealogical and historical documents on the Web. The LAFRANCE – Index with link to the original document of all of Quebec’s Catholic baptisms and burials from 1621 to 1861, all of Quebec’s Catholic marriages from 1621 to 1917 as well as all of Quebec’s Protestant marriages from 1760 to 1849. Marriages and Deaths 1926-1997 – Index with link to the original document of most of the marriages and deaths celebrated in Quebec between 1926 and 1997, all religious denominations included. Drouin Collection Records – All of Quebec’s parish registers from 1621 to 1940, as well as some from part of Ontario, New England and Acadia. 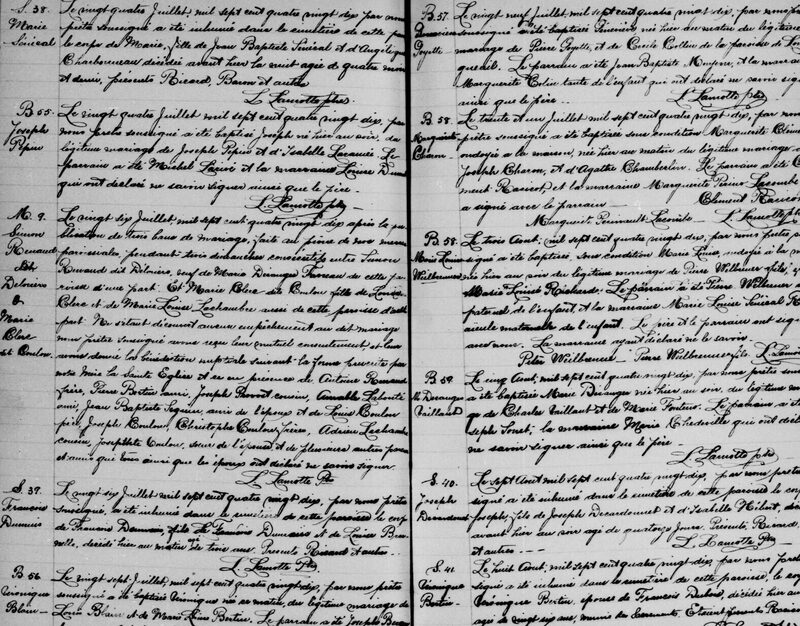 The Petit NBMDS – Baptism, marriage and burial files from the Laurentides, Outaouais, Bas-St-Laurent as well as the city of St-Hubert, from 1727 to 2011. The Connolly File – 6 500 000 Quebec baptism, marriage and burial files covering from 1621 to 2015. Drouin Institute’s Family Genealogies – 660 family genealogies produced by the Drouin Institute during the 20th century. Totals for over 230 000 pages. Drouin Institute’s miscellaneous Collections – Collection of images, documents, books, pictures and directories of historical and genealogical relevance. Contains the PRDH books, the Jetté dictionary, some municipal archives, old newspapers and much more. Acadia – Families – Family files, with link to the related original documents, pertaining to Acadians. Covers more than 70 000 Acadian families between the years 1621 and 1849. Postcards – Contains 256 000 postcards sent or received over the course of the 20th century. Can be searched by sender or recipient. Loiselle File – 1 044 434 marriage files covering all of Quebec as well as Fall River, MA and Manchester, NH from 1621 to the 1950s. Census – Contains Quebec’s 1881 and 1901 censuses as well as Ontario’s 1881 census. Notarized documents – Contains some 83 000 notarized documents indexed by type of contract, cited names, name of the notary, date and location. Linked to a digitized version of the original document. The Kardex – Marriage files covering from 1621 to 1950 for Quebec, Ontario as well as a small part of the United States. City directories – Contains a digitized version of Montreal (Lovell – 1843 to 2000) and Quebec city’s (Marcotte – 1822 to 1904) directories. There are 3 types of subscriptions to GenealogyQuebec.com. All 3 subscriptions give access to the entire library of tools and databases; only the length of the subscriptions differ. Prices are in Canadian dollar. Taxes will be applied for Canadian residents. Genealogy Quebec is geared towards both seasoned genealogists and novices alike. While a certain familiarity with the website is necessary to make the most of its 16 tools and collections, the majority of our users are able to retrace their ancestors through our 3 main tools, which happen to be the more straightforward and easy to use. These are the most comprehensive and detailed tools available on the website: The LAFRANCE, the Marriages and Deaths 1926-1997 tool, and the Obituary section. For most of our subscribers, these 3 tools will be sufficient to find their ancestors and retrace their lineage. All of these tools are equipped with a search engine. These are our complimentary research tools. They are used to address potential gaps in searches made using our primary research tools, or to add additional sources and information to these searches. All of these tools are equipped with a search engine. These tools use a file tree structure. They are not equipped with a search engine and must be browsed manually. On the Tools page, users may get more information regarding each tool, such as the type of document, the period and region covered as well as a short tutorial, by clicking on “More information”. You will find a series of articles about our numerous tools and collections on our blog. Establishing your ancestry and finding your ancestors using Genealogy Quebec. Next PostNext LAFRANCE update, addition of 15 000 newspaper obituaries and new blog articles on Genealogy Quebec!